Being assigned to the marketing department, it was definitely my privilege to work with such an amazing team in an energetic company with positive vibes. I received hands-on experience performing marketing roles, such as writing up content pieces and daily news for publication. I was overwhelmed when I saw my work published on social media! Speaking of my leisure time, I visited heaps of local attractions, like the Wheel of Brisbane overlooking the stunning Brisbane River, Australia Zoo, Gold Coast and a lot more! I have had so much fun travelling to incredible places and be surrounded by friendly Australians! I would like to thank my IPS, Clare, for supporting me along the way and making sure everything is on track. I hope other interns are doing great in their internship and have a fantastic stay in Australia! I won the scholarship from Trade Investment of Queensland which is called Best Semester Abroad. Working and studying in Australia has always been my dream since I love the diverse cultures and enjoy the nature. 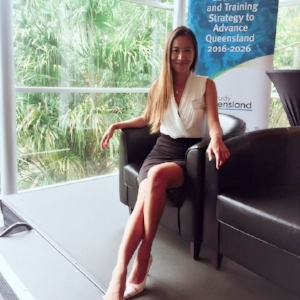 Doing internship in Australia can not only help me to develop professional network, which could be useful for future references but also have the opportunity to work with international team, that way I can learn new skills and improve my English quickly. I was very excited when I got the offer from TAFE International because I never had the experience to work abroad and especially in an international department. During the internship, I had the chance to meet the students from all around the world, helped them with the study inquiries and learned customer service whereas it's hard to have the opportunity to work with people from different nationality in Taiwan. This was truly an unique experience for me. The internship with TAFE has totally broadened my horizons. It has not only helped me to build a better quality on my resume, but also has grew my network. Networking is very important in the job search, and this internship gave me a great opportunity to meet many people in education field. I enjoyed working internationally and would truly love to come back to Australia. It is an incredibly beautiful and vibrant country that I would like to call home at some point in my life. Meeting new students who were coming to study in Queensland was absolutely the most exciting part of the internship. I could help them with their questions and share my experience to them. I love to learn various cultures and see the passion of the students about their study fields.The opportunity to be here will be something that I will never forget. It is my pleasure to be a part of this internship program, and be a part of this international team. I would highly recommend to do internships in Australia since you can learn so much from work and the society. Here are some tips I could provide you if you are thinking to do an internship in Australia. First, always have a positive attitude. Employers like to see someone who enjoys a challenge and is enthusiastic. It will reflect positively on your work and you’ll be more likely to get a good recommendation letter at the end of your placement, which is essential when looking for a job. Second, don't hesitate to ask for help. It is okay to ask for help and seek clarification and advice if you’re not sure about something. It is always better to do this first than to make mistakes and have to start all over again.Last but no least, be creative! Have a creative idea and share with people who you work with can help you to impress your supervisor or other colleagues. Let your team know about specific skills or interests you have that they might be able to tap into too. I have spent 5 months in Brisbane. I have studied English at UQ, made many friends from different countries and experienced a lot of things which I cannot do in Japan, but the thing I consider the most useful and practical is Internship in the hotel. […]I would like to thank you so much for everything you have done for me. I really appreciate it. It was so nice experience and enjoyable as well! "My name is Melanie and I am from Austria. My target was to make this summer vacation something special and I am proud to tell you: it was the greatest summer I have ever had. I was offered an internship with this company in their head office in Sydney. They have 8 stores around Australia. Although the office is really small, this did not mean that there was not enough work. One of my tasks entailed processing online orders including sending products to customers. I was allowed to improve my skills with communicating by phone with the stores and ensuring prompt pickup and delivery, further to these tasks I was expected to arrange a variety of quotes for necessary services which ensured all stores operated successfully. I really enjoyed the time at the company, and found on busy days we still had time to interact and have a joke which made my working day much fun. In the end I want to thank Caroline for her patience and the great time together, I always felt welcome and that made my internship even more perfect." "I'm sure that this experience will be great for my future, because I have grown in every way. I really can see the difference in my thoughts and this is amazing! For sure I'll go back home with a big baggage of experience! When I started with my host organisation, I thought it would be really difficult but now I know it’s possible to do so many things I never thought I could do. I’m giving my full potential here and I feel amazing when I receive good feedback from my co-workers, which is really gratifying. This experience has already impacted my life and I’m really happy for that. I can say I’m a new person. The highlight of this is experience is seeing how the things work in a different country. I have some work experience in Brazil and when you put all things together, it is amazing. The basic foundation of Finance and Accounting are the same, but the learning process is different, the policies foe each country are different and for sure this is the highlight."